For the fall 2016 edition of Edible Idaho, I popped in to check out the handcrafted sodas and tonics at this carefully tucked away drinking spot in downtown Boise. Inside the Adelmann Building in Boise, through the wooden double doors on Idaho Street, it’s not immediately apparent where to find Press & Pony. Confronted with stairs leading up to the right and heavy burgundy drapery with gold trim on the left, the stairs might seem like the better choice. But keep your eye out for a gap in the curtains. Press & Pony is dark—not only because of the dim lighting but because the wall-length wooden bar is a well-worn dark brown. The 35-seat space is intimate and feels a bit secretive. It also smells distinctly of French fries. 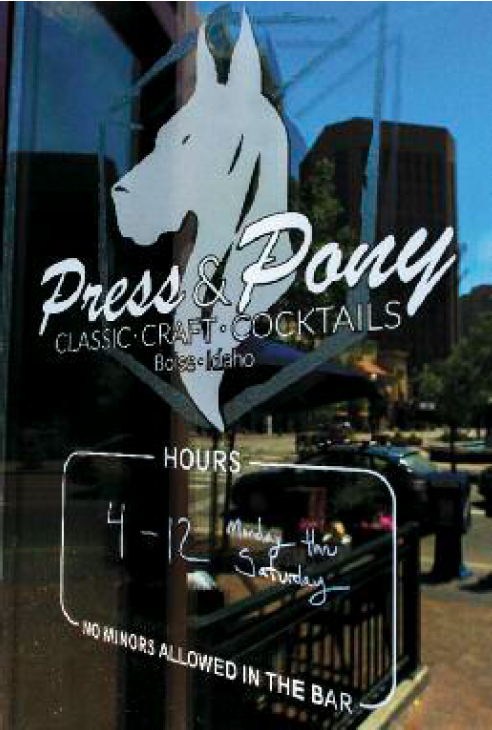 Press & Pony was opened in June 2015 by the two original owners of Boise Fry Company, Blake Lingle and Riley Huddleston. The two establishments share a doorway and a menu. Drinks can be enjoyed at the restaurant or on their patio, and food also makes its way into the bar. Press & Pony takes artisan cocktails beyond fresh squeezed juices to house-made tonics and sodas. “We want to make sure everything is as fresh as it can be,” said General Manager Jordan Krema. P&P’s cola—which is light, not at all syrupy, and a bit herbaceous—is made using Coca-Cola’s published recipe “without the bad stuff,” Krema says. He also makes a lemon-lime soda and a milky, amber-hued nonalcoholic ginger beer that tastes intensely like the fresh root without any of the bite. The bar also makes four tonics in-house, two of which rotate seasonally. On a recent visit, they included the Standard, a light base with hints of lavender, allspice and stone fruit; the Melon, which was light on the nose but packed a blast of watermelon up front; the Roots, made with blackened pineapple, dandelion root and mace, which had the biggest mouthfeel and a lingering bitterness; and the Triathlon, a magenta tonic made with beets that was both delicate and earthy. All of these concoctions are satisfying on their own and also make excellent cocktail bases.